“The woman doused you in fruit punch, what else can she do?” Bravo has released a new clip and details from season two of Odd Mom Out. The comedy stars Jill Kargman as a New York City wife and mother at odds with her Upper East Side peers. The cast also includes Andy Buckley, KK Glick, Joanna Cassidy, Sean Kleier, and Abby Elliott. Season two will see Jill return to her former job at a fashion magazine. Guest stars include Drew Barrymore, Molly Ringwald, Blythe Danner, and Amy Sedaris. The new season of Odd Mom Out premieres on June 20th at 10 p.m. ET/PT. Viewers will not want to miss the return of Bravo’s hit comedy series “Odd Mom Out,” created by and starring Jill Kargman, who plays a satirical version of herself trying to coexist with the demanding hierarchy of New York’s exclusive Upper East Side ecosystem. Also starring Abby Elliott, Andy Buckley, KK Glick, Sean Kleier, and Joanna Cassidy, season two features even more outrageous antics as the gang tries to redefine themselves and find happiness. Notable guest stars this season will include Drew Barrymore, Blythe Danner, Molly Ringwald, Meredith Vieira, Amy Sedaris, John Hodgman and several cast members from the Broadway phenomenon Hamilton. On the season two premiere, Monday, June 20th at 10pm ET/PT, Jill dips her toe back in the career world by visiting the fashion magazine where she used to work. But her excitement at being welcomed back with open arms is short-lived. This season, Jill decides it’s time to return to her job at the fashion magazine, where she soon butts heads with her former boss—who also happens to be her former nemesis. As Jill tries to reboot her career, Andy takes time off to care for the kids, quickly learning that being Mr. Mom is harder than he thought. Brooke is healing from Lex’s affair by milking him of millions in start-up money for her new passion project, an elegant accessories line. For his part, Lex has returned from Burning Man a reborn “brohemian,” claiming to have a greater conscience and a single-minded determination to win Brooke back. All the while, Vanessa continues to provide a comical constant for Jill, keeping her grounded through the unique trials and tribulations of navigating upscale Manhattan. 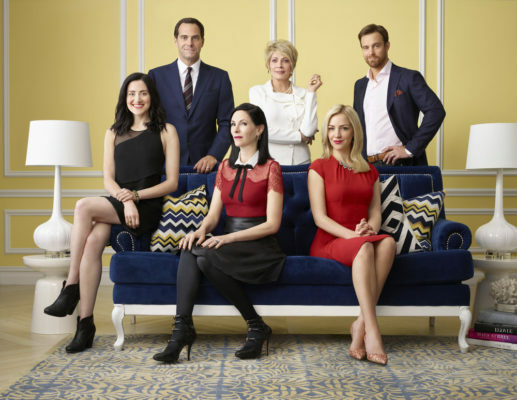 “Odd Mom Out” marks Bravo’s highest-rated new series launch in 2015. In its premiere season, the show averaged 958,000 total viewers and 568,000 in adults 18-49. In addition, “Odd Mom Out” stands as 2015’s most upscale new scripted comedy series on ad-supported cable, as well as ranking higher than any other new Bravo series for Video On Demand transactions. What do you think? Have you seen Odd Mom Out? Will you watch season two?